The conflict in Syria has resulted in a serious deterioration in access to health services for civilians across the country. Intensification in hostilities across Syria is having a “devastating” impact on civilians, United Nations agencies in the war-ravaged country said Wednesday, warning that the fighting is also severely limiting life-saving humanitarian operations. “In the last few weeks, increasing indiscriminate bombing, shelling and fighting forced tens of thousands of people to be uprooted,” said the UN agencies in a statement. “Accessing camps and other makeshift sites where internally displaced people are in dire need of aid is also urgently required. All affected civilians, wherever they are, must be protected, provided with assistance and accorded safe freedom of movement,” they added. The violence has severely affected almost all life-saving and economic sectors and medical and healthcare facilities throughout the country are operating at a fraction of the pre-crisis level. At the same time, the little resources that internally displaced persons and affected communities had have been exhausted, noted the UN agencies, calling on all parties – both inside and outside the country – to prevent further violence and enable humanitarian organizations to assist people in need. 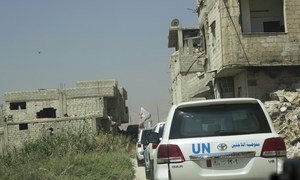 “Agreement by all parties and their allies is needed to facilitate the immediate and safe delivery of UN and Syrian Arab Red Crescent humanitarian convoys to people in need across Syria including those in besieged and hard-to-reach areas,” they underscored. Of particular urgency is facilitating medical evacuation of critically ill people especially in eastern Ghouta, Foah and Kefraya, as well as other locations, read the statement. “The UN in Syria reminds all parties of their obligation under international humanitarian and human rights law to protect civilians,” said the agencies, calling also for unrestricted humanitarian access to enable aid workers reach people in need with care, food and medical support. Meanwhile, the UN Special Envoy for Syria, Staffan de Mistura, announced Wednesday that he has sent invitations to the Syrian Government and the opposition, represented by the Syrian Negotiation Commission, to a special meeting with the UN in the framework of the Geneva political process. According to a note issued by the UN, the meeting will be held in Vienna, the capital of Austria, on 25-26 January. On top of the already-desperate conditions in Syria’s war-ravaged East Ghouta and north-west Idlib governorate, a violence upsurge is intensifying insecurity, the United Nations food relief agency said Tuesday.